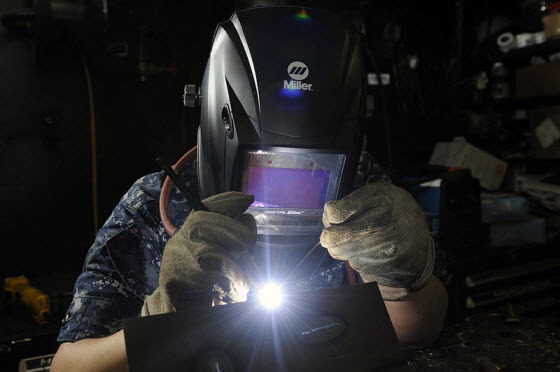 What's The Difference Between A Mig Welder and a Tig Welder? The machines used for tig are variable voltage constant current (amperage) machines. The voltage will increase or decrease slightly to try to maintain the arc with variations in the arc length. This is the same type machine used for stick rod welding, and with a bump start any stick rod machine can be used for tig, although many do not work well at the really low amperage (10 to 15 amps). Wire feed, including mig and flux core, uses a constant voltage, variable amperage. The voltage is set, and the amperage will vary to maintain the arc and burn off the wire. From the welders perspective, the most obvious difference is that with variable voltage (stick, tig), when arc length is increased (lifting the rod or tig torch), the voltage increases causing more energy (heat) that typically spreads and flattens the weld. When the arc length is decreased, the voltage decreases causing less heat and stacking up weld. When individuals are learning to weld, you often see the weld bead vary in width. This happens when the arc length varies, causing more or less heat. When you have control of the arc length, you can make use the slight changes in voltage. If you want a flatter weld, use a slightly longer arc length with the rod nearly straight up and down. If your trying to fill a gap, use a shorter arc length to reduce the voltage and cut down on the "push or arc force". With mig, when the gun is pulled back, the wire stickout (distance from the metal to the contact tip) increases, causing the wire to preheat which reduces the amperage. Holding the gun closer will slightly increase the amperage. To some extent, this variable amperage can be used. Holding the gun closer for starts seems to work well, and pulling the gun back (increasing the wire stickout) a little cools the weld to fill gaps. You have to be careful with mig, if you pull the gun back too far you lose the purge gas and get porosity in the weld. Pulling the gun back works well with self shielded flux core. I fixed a rusty floor board in a truck one time. When I'd hit a rust spot and burn through, I'd back the gun out until there was just enough heat to tie in the filler and build metal on the edges of the hole (couldn't to that with mig). There are "suitcase" welders that permit welding with wire feed using a variable voltage welding constant current machine. These sense the voltage and adjust the wire speed with changes in the voltage. They work well with the flux core wires and may work ok with mig in the spray mode of transfer. They are not really recommended for short circuit mig.